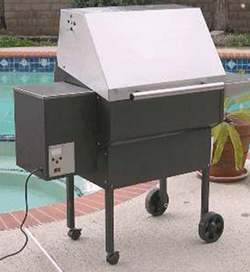 Sweet Home pellet grills are manufactured in Montclair, California - a good climate for outdoor dining. These are neat looking pellet grills with a couple of unique features. Firstly, there's a 'low-pellet' sensor which allows the control board to beep when you're likely to run out of fuel during cooking. Temperature control is digital, connected to a thermocouple in the cooking area. The control board will sample the ambient air temperature and compensate the pellet feed as necessary. There is the option of having a remote control unit. 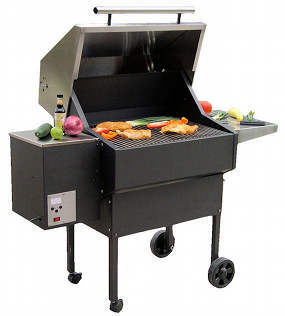 Standard, this pellet grill comes with stainless steel dual grates and a stainless steel drip tray. Stainless steel hood and side shelves are optional. The warranty is pretty good too, giving five years on the grill construction and two years on the electrical components. Cooking area 450 sq. ins. Dimensions H 44.75" W 53" D 23.75"
Temperature control Digital, with thermocouple. Automatic compensation for ambient air temperature. Five years on construction, two years on electrical components. Cooking area 650 sq. ins. Dimensions H 44.75" 59.5W " 25.75D "
This is a five minute video taking you through the important points of Sweet Home pellet grills.